If everyone will take your beads, we’re going to learn a meditation called japa meditation, and sometimes it’s called japa yoga. You’ll notice one bead is different than all the rest. It’s bigger, it sticks up, it has a tassel on it. This is called the head bead. We do not chant the maha-mantra on the head bead. This is an indicator bead that lets us know where to begin and where to end. That also engages the sense of speech: tongue, lips and so on. I will again listen to the sound, engaging my ears. Again I put my mind on the sound, engaging my mind. And if I’m reading the mantra, that engages my eyes. So now we have either four or five senses engaged in the spiritual activity. When we’ve finished the maha-mantra on the first bead, we pull the beads again slightly toward the body, put our thumb on the second bead, and chant the maha-mantra. Next: the third bead, the forth bead, etc. Gradually we chant on every bead. And we arrive at the head bead on the opposite side. This is called one round because we’ve been around the beads one time. At this point we will chant another mantra, which you don’t have on the card, but it’s easy: HARIBOL. Haribol means Chant the Holy names, chant the names of God. If we would like to continue to chant, in other words, do a second round, remember we do not chant on the head bead. We also do not jump over top of the head bead. What we do is take the last bead we’re holding and move it to the front. Now that becomes the first bead for round number two. So again we put our thumb on the bead and chant the maha-mantra. Once again we chant on all the beads and come to the head bead again. HARIBOL. Two rounds. Again we turn the beads around, chant on each one, come to the head bead. HARIBOL. Three rounds. 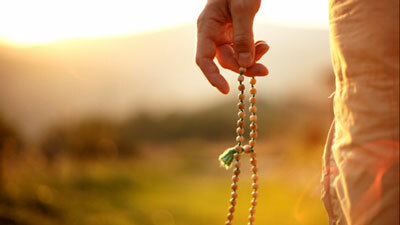 We all have the same number of beads on our mala. So that means if we don’t forget to change beads and if we don’t skip any beads, we’ll all arrive at the head bead at the same time and we can all chant HARIBOL together. Again I’ll give you a little demonstration to show how it works. And then we can do it together. OK.
And one last thing. Before we begin the first round, we’re just going to touch the head bead and chant the mantra GAURANGA. OK, so here’s the demonstration. I’m touching the head bead. GAURANGA. Now I move to the first bead. HARE KRISHNA HARE KRISHNA, KRISHNA KRISHNA HARE HARE / HARE RAMA HARE RAMA, RAMA RAMA HARE HARE. Now I move two the second bead. HARE KRISHNA… etc. All right, let’s all do one round of japa yoga. Remember: meditate on the sound. I will say GAURANGA on the head bead and then you respond, like we did before. And then we can all go to the first bead together with the maha-mantra. So relax, chant the mantras, and HARIBOL at the end. HARIBOL! OK, congratulations. You’ve done one round of japa if you never do another. But, of course, you will. And when you do japa on your own, it actually doesn’t sound like this. We do it in this way because it’s easy to stay together as a group. But when we do it privately, it sounds more like this: HARE KRISHNA HARE KRISHNA, KRISHNA KRISHNA HARE HARE / HARE RAMA HARE RAMA, RAMA RAMA HARE HARE (repeats twice more quickly). So now we’re going to do a short session like this. We’re not trying to stay together as a group. Everybody’s independent. So you can go faster, you can go slower; whatever is comfortable for you. But always remember, when doing japa yoga, chant loud enough that you can clearly hear the mantra and pronounce each name clearly. So now the main mantra that you will hear should be your own. And then you hear others in the background. Once again we’ll start with GAURANGA on the head bead. And we will chant until I say HARIBOL. HARIBOL! There’s a few things you should know about doing japa yoga. Number one, you should set a certain number of rounds that you do every day and every day do that number. In the beginning we try to make it easy. We say just do two round a day. That’s not very many, we did more than one just now. And they don’t even have to be at the same time of day. You could do one in the morning and one in the evening, if you want. In fact, a nice schedule is to wake up in the morning, do Gauranga meditation and one round of japa. In the evening: do one round of japa, Gauranga meditation and go to sleep. But, of course, again, you can do it any time. If two rounds are going well, and it should, then you can increase the number, “OK, now I do four rounds a day.” And every day you do four. Maybe later six, then eight. But whatever number you set, be realistic. Don’t say, “I’m gonna do twenty rounds a day,” and never do it. See, that’s not good. And also these are minimum numbers. Some day you may do more than that number. But the next day you do at least the minimum. Also you can do japa yoga while you walk. It doesn’t always have to be done sitting. We walk a lot every day. We walk to work, to school, to shop, to see friends. So if we’ve got our beads with us, we can turn that into a meditation. Walk along and chant on your beads. We’re just walking and chanting on our beads. And we call these japa walks. Everywhere in the world I go, early in the morning I see people out walking their dogs. They’re out walking their dogs, I’m out walking my beads. If you got a dog, walk your dog and your beads. But one thing we ask: if you do japa yoga while you walk, please keep your eyes open. Also you can do japa yoga on airplanes, trains, buses, cars. And to help you do that, we’d like to give you these beads as a gift. Take them home and practice what you’ve learned tonight. And when you wear them out, let us know. We’ll send you another pair. One last thing about the beads. Because we chant God’s names on the beads, these are special beads. So we don’t put them in dirty places, we don’t put them on our feet, we don’t put them on the ground. Special beads – special care.